KMB logo design by Michael Calkins. Music samples player powered by Flash MP3 Player. Thanks to Sharon Station Studios. 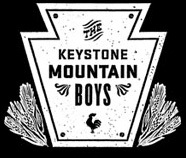 ©2011, Keystone Mountain Boys. All rights reserved.